People needing to get that Civil War opera fix may want to travel to San Francisco this October for the premiere of "Appomattox," by Philip Glass. "Appomattox," which will feature baritone Dwayne Croft as Robert E. Lee and bass-baritone Andrew Shore as Ulysses S. Grant, is [David] Gockley's first San Francisco commission. Conductor Dennis Russell Davies, who led the 1984 premiere of Glass' "Akhnaten," and director George C. Wolfe will make their company debuts. "This is an opera about men and events," Glass said. "There is hardly a person in public life today with the moral and intellectual stature of these two men, and I wanted to—well, honor them isn't the right word—but put them on the stage and see what they were about." Federal artillery captain and Medal of Honor-winner Hubert "Leatherbreeches" Dilger died on May 4, 1911 (scroll down on this page for a photo of Captain Dilger). Good thing he didn't live long enough to see his son waging chemical warfare on America during this country's lead-up to and participation in World War I. One naturally assumes Dilger would have been appalled at the prospect of his offspring conniving against the adopted homeland Capt. Dilger so bravely served. But who can say? Perhaps, somehow, Hubert Dilger would have understood his son's devotion to the Fatherland. What a difference a generation makes. 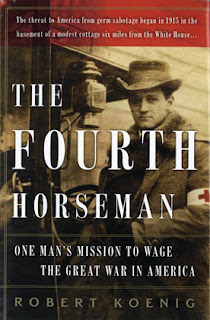 Once I finish The Fourth Horseman (great title! ), I hope the traitorous son's actions will have been put into the context of an era, and a family, that I know precious little about. The most famous and dramatic Federal resistance on that afternoon came from a German-immigrant artillery officer, Capt. Hubert Dilger. The captain had turned an Ohio battery into a well-tuned unit, despite what he called "the intrigues & petit jealousies of the different german cliques" in the 11th Corps, and had become recognizable by the doeskin German-style britches he wore. When the Federal right collapsed on May 2, "Leatherbreeches" Dilger retired methodically down the Orange Turnpike (modern State Route 3), firing a single cannon in the road, then falling back and doing it again. The Medal of Honor (usually miscalled the Congressional Medal of Honor), meant appreciably less during the Civil War than it came to signify for a time during the mid-20th century. Four New Englanders who won the medal for actions near Fredericksburg, for instance, received them three decades later--immediately after (to suggest coincidence strains credulity) one of them became his state's adjutant general, and a second of them became his assistant. It is impossible, however, to doubt that Capt. Dilger richly deserved the honor, by the standards of any era. "Fought his guns until the enemy were upon him," the citation read, "then with one gun hauled in the road by hand he formed the rear guard and kept the enemy at bay by the rapidity of his fire and was the last man in the retreat." The devoutly Virginian historian who chronicled the history of Robert E. Lee's artillery admiringly described Dilger's feat as "an example of almost superhuman courage and energy." Virginian scenery and people apparently fetched Hubert Dilger. In 1881, having grown rich by inheritance, he bought a large stock farm near Front Royal and began raising pure-bred cattle. Two years later a prize bull, perhaps unconvinced of Dilger's credentials as a freshly converted Virginian, gored him badly, but the old warrior survived and lived into the new century. "Anton Dilger, an American saboteur working for the German government, rented lodgings not 6 miles from the White House. In his basement, he set up a small laboratory and, on behalf of the General Staff in Berlin, he began a highly secret campaign to wage biological warfare on U.S. soil. His target would be the horses and cattle supplied to the Allied armies by the then-neutral United States, and Dilger set about cultivating anthrax bacteria and Pseudomonas mallei, the germ that causes glanders, a crippling equine disease. But who was Dilger, and how did the son of a Union Army captain become a German secret agent?" Later, Anton Dilger approached the Mexican government to foster an alliance with Germany, tempting the Mexicans with the prospect of reclaiming the American Southwest. As it turned out, the sins of the son failed to eclipse the valor of the father. Anton Dilger, the Shenandoah Valley saboteur with a keen interest in biological warfare, died young (34) at the hands of a common virus, the Spanish Flu. No medals for him. I look forward to seeing some of them more than others. I like to scan them to discover who's written one more of the books I forgot to write. And I like to make note of those interesting-looking new titles about subjects that weren't on anyone's radar. So many presses are quietly doing solid work in the Civil War arena, like Tennessee, UNC, Fordham, LSU, Kentucky, Kansas. Two of the catalogs that often hold the most promise—for my particular interests—are those of The University of Arkansas Press (lately), and University of Nebraska Press (always). Arkansas' Spring 2007 catalog announces the latest in their phenomenal "Portraits of Conflict" series, A Photographic History of Tennessee in the Civil War, by Univ. of North Texas associate professor Richard B. McCaslin. Previously, the series has covered Georgia, South Carolina, North Carolina, Mississippi, Louisiana, Texas, and Arkansas. All are stunningly attractive works, expensive to manufacture, and expensive to buy—but thank goodness someone is putting these out. I don't actually own any of the volumes of this series, because they cost as much as an iPod Shuffle, and I don't have an iPod yet, even though my collection of unheard KQED Forum Podcasts is burgeoning. But I have seen and examined several books in the Portraits series. I may buy one someday. After I get an iPod. Another Arkansas series that I like is "The Civil War in the West." The spring catalog has a promising addition to it: Confederate Guerrilla, The Civil War Memoir of Joseph M. Bailey, edited by T. Lindsay Baker—I tried to link to a description, but their web site is maddeningly difficult to navigate. And Nebraska Press, well, what can you say? 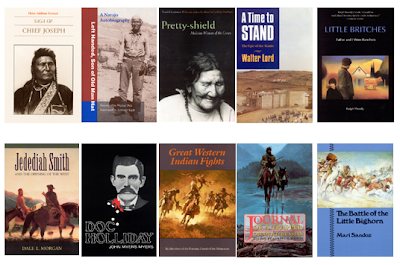 Here's what you can say: their history list, and their Bison Books imprint, are the best. Their catalog is, without fail, chock-full of intriguing new titles in all subject areas. I like their history books so much, I've twice applied for jobs there (just a little bit afraid that I might actually get an interview, since I love California—not that I don't have fond memories of Lincoln, where my big sisters went to college, and where once, the Big Red machine was an unstoppable powerhouse). Bison has the masterfully assembled series, "This Hallowed Ground: Guides to Civil War Battlefields" (Brooks Simpson, Mark Grimsley, and Steven Woodworth, series editors). It's the perfect series: fresh, attractive, well-written, useful. The Spring/Summer 2007 catalog presents The Peninsula & Seven Days, A Battlefield Guide, by Brian K. Burton. He's not a historian most of us would associate with that campaign, but I trust the editors' judgment. I see over at Civil Warriors, the Wilson's Creek, Pea Ridge, and Prairie Grove guide is out, and there's no one you would want to put together a guide like that besides Earl J. Hess, Richard W. Hatcher III, William Garrett Piston, and William L. Shea. That's as perfect a marriage as you'll find on any one string of battles in the war. Also in Nebraska's Spring/Summer catalog: Jeb Stuart and the Confederate Defeat at Gettysburg, by Warren C. Robinson, professor emeritus at Penn State (thank you, Nebraska, for paying someone to build a beautiful, easy-to-use web site). I know nothing about this book, and if it came out under any of a half dozen other imprints, I wouldn't consider for one minute buying a book on this subject—I would just go to the Gettysburg Discussion Group archives and read 30 or 40 month-long threads, searching for entries by Licensed Battlefield Guides like the inimitable Wayne Wachsmuth. But because Nebraska published it, my curiosity is piqued. Nebraska has also brought out Scott Patchan's Shenandoah Summer: The 1864 Valley Campaign. This looks great, and my interest is colored by having spent a couple days with Scott as tour guide on the battlefields of Manassas (Civil War Forum Reunion in 2005). He was impressive. The catalog gives a quote by Bill Miller, saying that Scott "is a 'boots-on-the-ground' historian, who works not just in the archives but also in the sun and the rain and tall grass. Patchan's mastery of the topography and the battlefields of the Valley is what sets him apart and, together with his deep research, gives his analysis of the campaign an unimpeachable authority." Now, I know Bill Miller, and he doesn't lie. He might even tell you you look fat in those pants, if you ask him, so don't ask if you don't want to know. He doesn't speak well of bad books. Good enough for me—can't wait to read this one. Like everyone else in our little corner of the Civil War blogworld, I'm a regular reader of Dimitri Rotov's Civil War Bookshelf. I enjoy the periodic, genuinely intriguing flashes of insight that come from really smart history junkies. Likewise, I tune in for Dimitri's gratuitously provocative potshots (comments disabled for good reason), and the mesmerizingly inscrutable diatribes that are becoming something of a signature entry at CWB. I do want to respond to one of Dimitri's January 2nd posts, since it is directed toward something I worked on. First, he outlined what qualities or circumstances make a work ideal for print-on-demand: "Multi-year, complex research projects, rich in data; Total authorial control over production and design; Aimed at a pre-existing audiences." And to close the snippet, regarding John and David Eicher's magisterial (I've been waiting to use that word) Civil War High Commands. Dimitri wrote, "For this, therefore, to be brought out by a conventional publisher is preposterous." I read that and wondered if "preposterous" was used in the same sense that a crew member of the Starship Enterprise might regard the archaic notion of currency preposterous when no currency was required, and when the sum total of human knowledge could be had for the asking from the ship's computer. I have opinions on the subject. 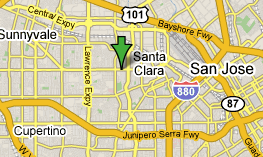 I worked on that book at Stanford University Press from start to finish, and even selected the printer. And since I had responsibility for reprints, I was also the person at SUP most involved with the then-fledgling print-on-demand programs that all university presses were beginning to embrace in earnest. At Stanford, we started out with Ingram's POD outfit, Lightning Source, but eventually transferred everything to the efficient and convenient service offered by the University of Chicago Press, who served as distributors for about 20 university presses at the time. Edwards Brothers, one of the first printers to get a true digital program off the ground, set up a print-on-demand service inside Chicago's distribution facility, and before long they had the ability to fulfill even the smallest bookstore orders for backlist titles that would otherwise have gone out of print. An exciting and dramatic shift. The unit costs are high, but it still pays to keep certain steady sellers available. Print-on-demand technology is ever-changing, but it only makes sense economically within certain parameters, governed mainly by page length and print run, or demand. Aesthetic considerations went out the window once the technology improved enough to approximate the original. There are thousands of great candidates for print-on-demand, but the Eicher reference work was not one of them. For starters, when Civil War High Commands came out, there was no POD provider capable of producing a book of more than 1,000 pages, and I'm guessing that hasn't changed (the cut-off used to be around 848pp). But here's the kicker, and why it's "preposterous" to think for even one second that a large reference work like the Eicher & Eicher book could be brought out POD in its first printing. Producing a massive reference work is astonishingly expensive. To then release it as print-on-demand volume would mean trying to recoup those costs by exponentially multiplying the unit cost. As opposed to printing 1,000's of copies conventionally for a fraction of the cost. Dimitri spoke of a "pre-existing audience," but if that audience can be expected to be up over 500 and into the thousands, it would be silly to publish the book at the highest unit cost possible. I think I do know what he's trying to say—that compilations of data like the Eicher and Eicher book are short-shrifted by conventional publishing, that organic databases like that should be allowed to breathe, and grow with the digital flexibility of frequent updates, and corrections (something happening now with online journals). That's all well and good, if people like David Eicher and his dad are willing to simply make their decades of work available on-line in the spirit of advancing knowledge. We're just not there yet. 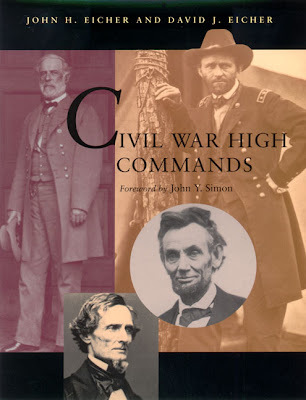 A book like Civil War High Commands is, by definition, a labor of love. But it's too costly and impractical for print-on-demand. If not for a conventional publisher, I would argue, this work would not be published at all. In fact, I would make another distinction. If a university press, devoted to scholarship for scholarship's sake, had not taken on this project, it would not exist in book form. Hmmm. Didn't realize I felt so defensive about this subject. In truth, I am really into print-on-demand—an enthusiastic student of that technology—but I just love that Eicher book, in all its conventional, smyth sewn, acid-free glory. 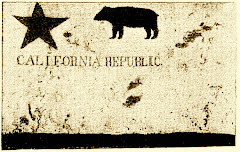 One hundred and sixty years ago today, men chose sides and squared off to determine the fate of Alta California. 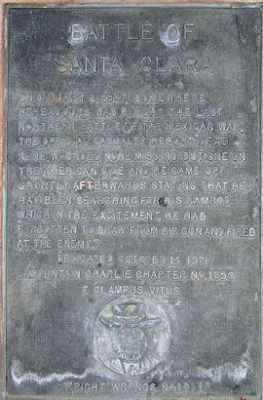 There's no trace of the "battlefield" today, just a corroded and forgotten E. Clampus Vitus plaque along the historic King's Highway—El Camino Real—in the old town of Santa Clara. 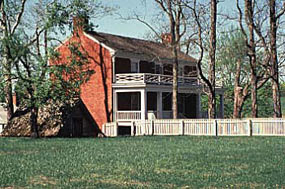 The warriors of 1847 would not recognize the site today. Concrete, discount stores, non-indigenous palm trees (what is with all the palm trees? ), and top-flight Vietnamese noodle houses have claimed his hallowed ground, while the barely readable monument momentarily delays Jack in the Box burger wrappers drifting from the nearby bus stop on their way toward San Jose. I make note of the Battle of Santa Clara today so that effete Eastern readers will come to understand that not all of our nation's storied military history occurred on their side of the Rockies. NORTHERN BATTLE OF THE MEXICAN WAR.